I’ve pretty much resigned to the fact that I will never get my real deal Malaysian food in Sydney. Admittedly I’ve stopped trying so if there is a new joint that professes to provide authenticity, it’s likely I haven’t tried it nor will I. See, the kind of Malaysian food that gets my taste buds salivating isn’t even the food you find on our humble streets, hawker centres or even pasar malams. As cliché as this sounds, it’s dishes made by my grandma that can only be found at home. And with that introduction, let me segue to the latest little cafe to open in Surry Hills, Cafe Rumah. Rumah being Malay for house or home. Cafe Rumah doesn’t fall into the category of Malaysian eateries I avoid because it isn’t strictly traditional Malaysian food. 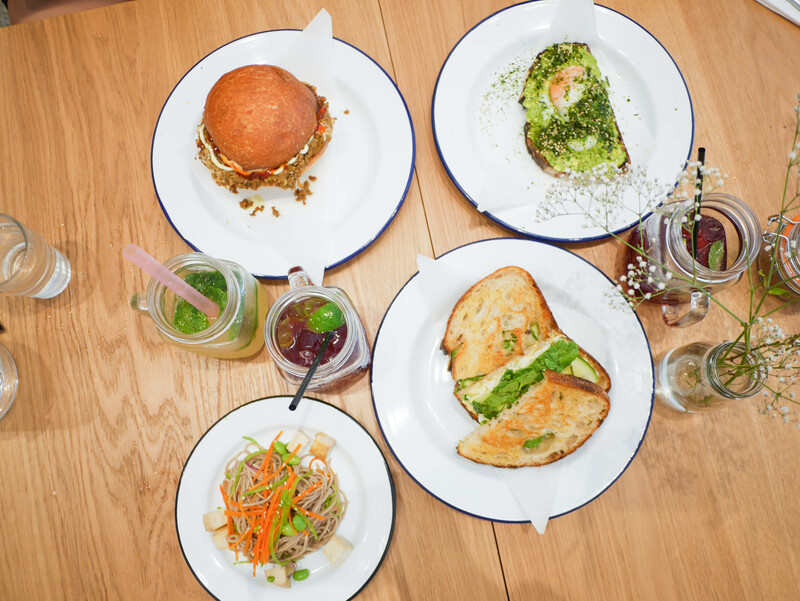 Like many other cafes opening up in Sydney nowadays, Cafe Rumah aims to hit that sweet spot of Asian/brunch fusion. The name and the location are fitting for a catch up with one friend I hardly see and another whose been gone for a year overseas. 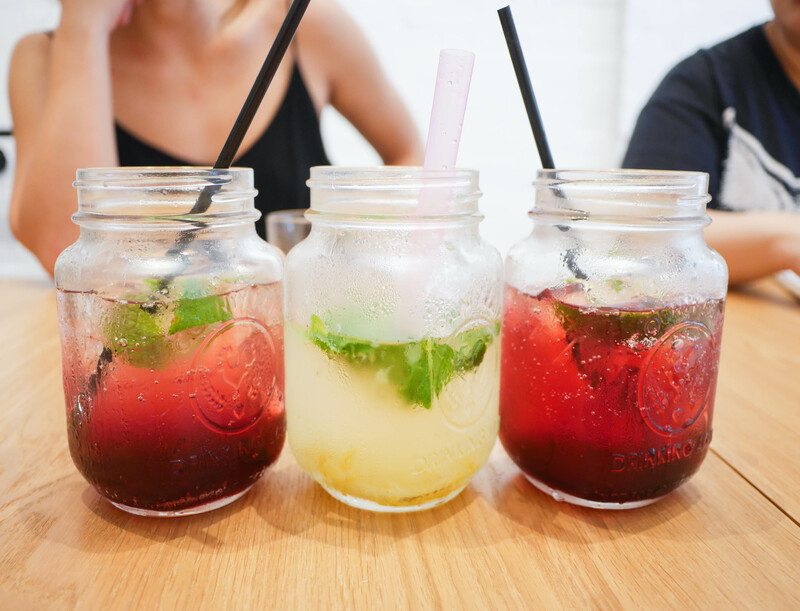 It’s a sweltering day in Sydney so all systems are go for a refreshing fizzy drink each. My JB special tastes like Ribena mixed with soda and I pretend that soda is an okay option because I’m not having coffee. I prefer it to Em’s yuzu that’s a tiny bit too bland for me. Sandwich prices range from an affordable $10 to a ‘still-okay’ $15 depending on the filling. From memory, the options aren’t particularly Malaysian-sounding. I part dollars for this particular sanga I love a good egg and watercress combination. 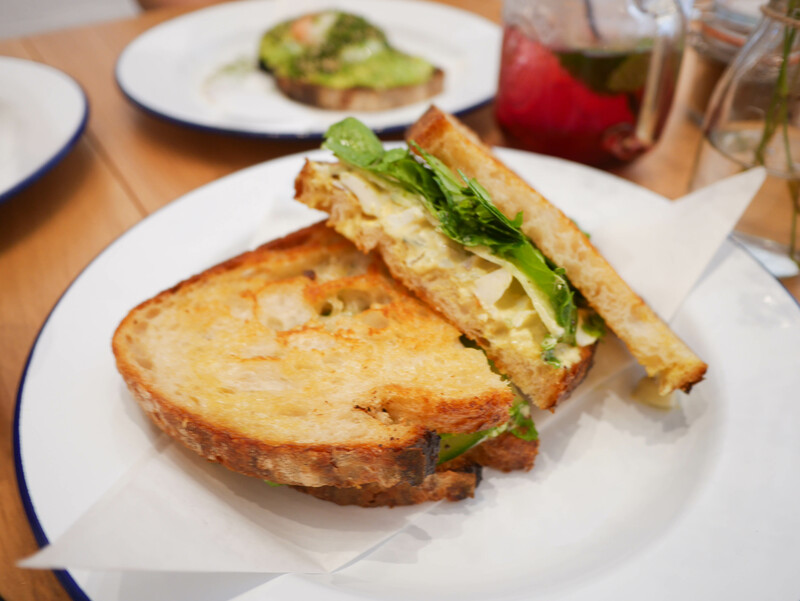 The egg salad is milky and delicious with chunks of hard boiled egg overflowing between bread. It could stand a bit more curry flavour in it for it to qualify as a curried egg sandwich. The bread is quite fantastic, an error on my part for not enquiring where it’s from. Apologies for the poor photo. 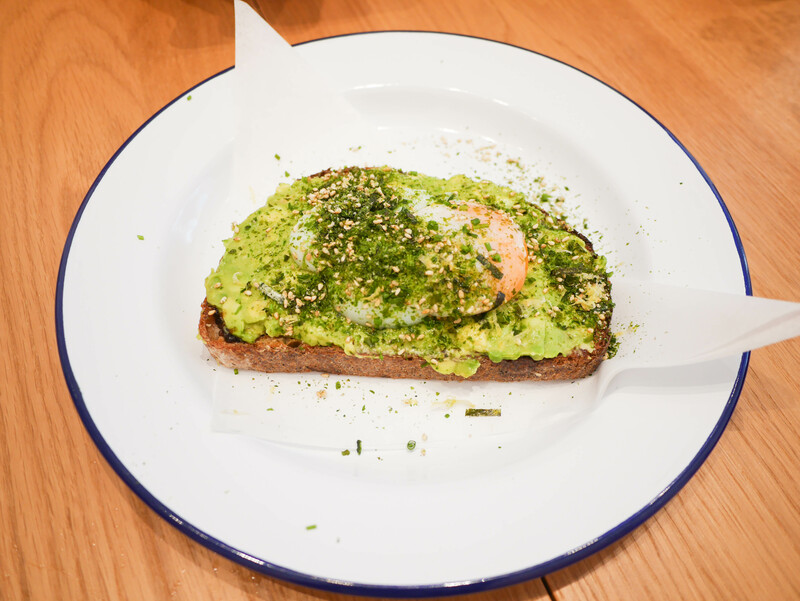 I came close to rolling my eyes at the thought of another avo-toast rendition before realising that it’s actually a pretty smart idea to have it as a staple in your cafe, just in case there’s a picky-eater in a group who just wants a no-nonsense breakfast. Cafe Rumah tops theirs with a lovely onsen egg much like the one Devon is famous for. The kicker is the furikake. It’s something I have been doing for years at home with my own avocado and toast brekfasts albeit an accidental discovery during the days when I added furikake to everything. Bonus points to you Rumah if you get the egg-flavoured furikake next time! Last but certainly not least is the Roti John, available at a mere $9. The name roti might be a bit misleading as people tend to know ‘roti’ as meaning the puffed up flakey dough pancake things that Mamak tosses. But here’s your second Malay 101 class folks, the word roti just means bread. Roti John is actually the name for an omelette-mince sandwich that we have back home that’s usually on a baguette/long roll type bread. The one we have on display here certainly looks like the child of a Malaysian Roti John and a bacon and egg roll. Perhaps it should be renamed the John Roll? Anyway I have a bite of this even though it’s Em’s because I can’t resist the smells and it is pretty great. 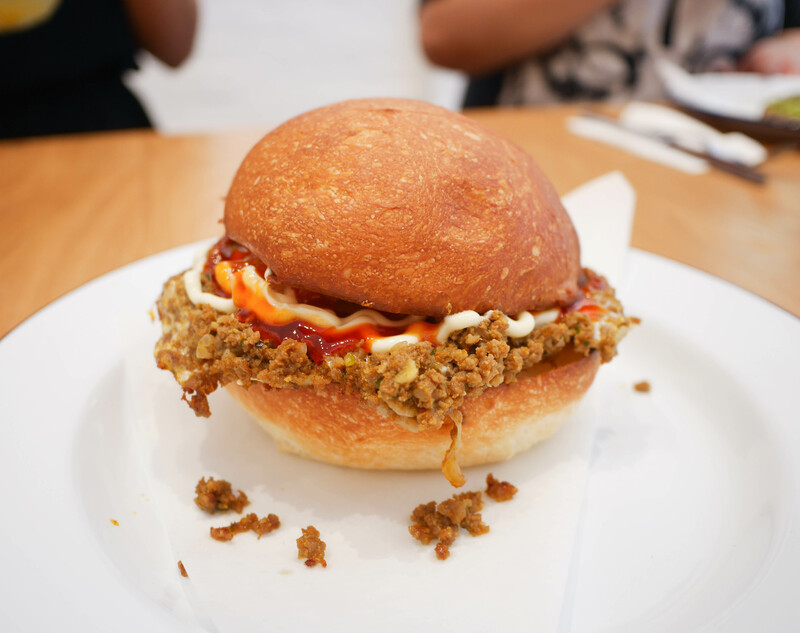 It’s overflowing with beef mince that goes oh so sinfully well with the fried egg. Lashings of mayo and chilli sauce (or sos cili if you prefer) complete the best-worst thing you could possibly have for breakfast. A selection of salads is also available and you can mix and match them depending on the size you get. Pictured here is a serving size ‘small’ of only the Japanese soba. 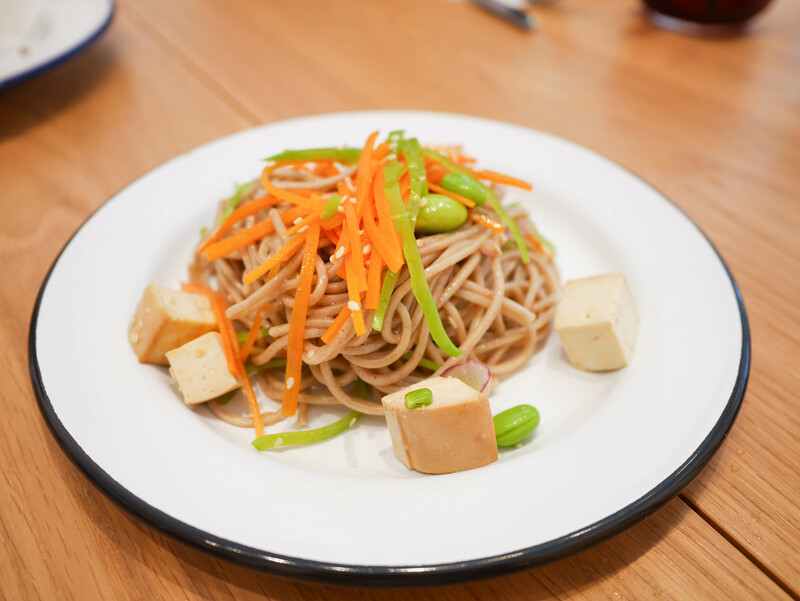 Dressed in sesame oil and topped with your usual suspects of carrot, sesame seeds, tofu and edamame, it’s a nice side but not something you’d come back specifically for. All in all, lunch was pleasant at a pretty reasonable price. They have a couple of desserts that could be interesting like kaya madelines and the daily kuih on offer but that will be a story for another time. The next time I go back will be when their Instagram showcases pulut tai tai. Then I’m buying the lot. Dang, I was actually thinking of this place for our catchup – but looks like you beat me to the chase!